Adirondack Chairs are a classic piece of outdoor furniture. 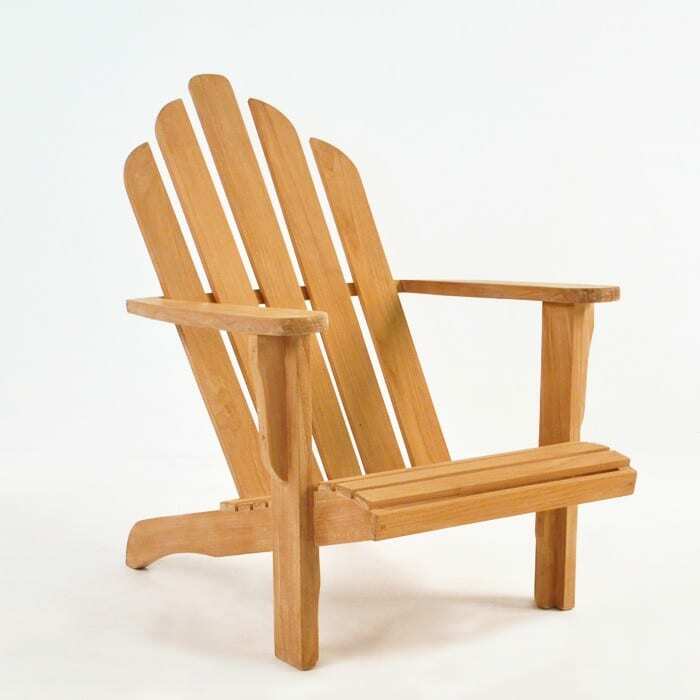 Design Warehouse offers teak Adirondack chairs and footrests (ottomans) which offer a clean and long lasting version of the timeless Adirondack chair. You could imagine these chairs on your patio, porch, lawn or in your garden as a focal point for relaxation that is both functional and memorable. For casual outdoor lounging, one might find the design of this chair, right in line with their ideas of comfort. But outside of pure comfort, you’ll also be able to enjoy this chair for many years to come as it’s made from the best hardwood for outdoor usage: Teak. Additionally the Design Warehouse Adirondack chairs are finished impeccably, with all the best features of the original design. The Adirondack chair design has a somewhat controversial history with the Thomas Lee/Harry Bunnell design being touted as the original and as a design that has been used the world over for comfortable and approachable outdoor relaxation chairs. Some might say that there are more Adirondack chairs currently in production which follow the “improvements” made in 1938 by Irving Wolpin, who filed for a different patent by modifying the original 11 plank Adirondack furniture design patented in 1905. These improvements on the design included a rounded back on the chair and a seating surface that was contoured for more comfort. Some believe William West Durant was influential (or that he himself designed the chair) due to his early adoption of the Westport style chairs in his father’s venture in developing the Adirondack Mountains as a resort. These chairs were named after the town of Westport in New York, where it became popular as a chair to be used by vacationers in the area. Originally there was some conflict involved in the ownership of the design, as it is believed that Thomas Lee had the design stolen by Harry Bunnell. Adirondack chairs were designed to endure a relatively harsh climate in the Adirondack Mountains, while maintaining the rustic and organic feeling of the surrounding land. This rustic style was simple, but had a heavy focus on relaxation and made the user more likely to stay seated and enjoy the outdoors. Adirondack chairs have always been outdoor furniture; commonly found on porches, in clearings near a cabin or lodge and in designated entertainment or relaxation areas just outside the home. Teak is the optimum outdoor material to ensure long lasting looks and integrity. The natural qualities of teak wood make it a weather resistant material and the density and makeup of the wood keeps it looking good and maintains the structural integrity for much longer than other woods. As you look through the competition in the outdoor furniture industry, Adirondack chairs are typically made of cheap soft woods, or woods that aren’t as naturally weather resistant as Grade-A Teak. Frequently, you’ll find consumer reviews that point out the short life of the materials or the paint that covers the wood. With Teak, you don’t have that concern. With proper maintenance you could ensure that the light golden honey color remains if you like that look; or you can watch as the teak wood ages gracefully to a nice silvery grey patina and takes on an even more rustic appearance. Muskoka chairs (the Canadian name) or Adirondack Chairs have shown their timeless qualities and they can be found dotting the backyards of fans just about everywhere in the world. Campgrounds and outdoor lodges everywhere have examples of high quality Adirondack chairs, including Design Warehouse versions. We have sold hundreds of these chairs to resorts, end user consumers and enthusiasts all over the world, where we frequently hear back from them about the high quality of our furniture and their satisfaction with our unique business model. We offer all designs in stock now, delivery via astute handling and all of our furniture is fully assembled ready to enjoy. Furthermore, we offer wholesale pricing direct to the consumer, with the highest grade of materials and craftsmanship. We recognize the clear benefits of using high quality teak in our robust Adirondack chairs and the clear relaxation benefits of the design of these chairs. Our Adirondack chairs offer the highest quality and the longest life of any available on the market. Most importantly, if you’re looking for a great value in a chair that might last forever, you need look no further than you already have. Design Warehouse Adirondack chairs are built to exacting standards, using the highest quality outdoor furniture materials (Grade-A Teak) and built to heavy dimensions which are beefier than our competitor’s. In fact, you’ll not only get higher quality, but our Adirondack chairs are in stock now, fully assembled; delivered by high-end delivery service at a significant discount to our competitors across the board. Looking For Other Relaxing Chair Styles? Check out our club chairs and outdoor lounge chairs or other outdoor furniture.